Among other things, I have made three Eifel Tower like renderings. The first one is based on the work ENDPIRE III by Artist Alex Cherry. Below is the final result of one of my sessions. As you can see, this is not an actual photograph but, rather, it is an original artwork (probably based on a B&W photo). Also, you might note that the original is not too bad, in fact it is quite bold but, also, quite melancholy. You have permission to download this image, and do the same (crop and/or set as your wallpaper), as well as make your own. However, please do not redistribute any of these images without giving me and/or the original author(s) credit and/or referencing this article. To help you out, I am going to teach you exactly how to achieve this effect as well as another two, completely different ones. First, download the image to your hard drive and open it with either the Polarr 2.0 web or chrome app. We will not be using any other tools except for “lens correction” and, “effects”, so you can minimize those sections. Set the chromatic shift amount to -100 (or as little as -70 if you want). At this point, you should already start to see the effect you want! Now, set distortion to somewhere between -50 and, -100 to see your hard work finally come to fruition. This will give you the completely a time-shifted, twisted, flying-through-space, super-cool awesome look. If you really want take take advantage of this effect then, I highly recommend that you take it to the MAX at -100 for the distortion, not some weak-as-heck number like -50 or even -70. See how easy that was? Your own piece of art! To finalize this effect, and further make it your own, you might want to consider playing around with the vignette or, adding some amount of fringing. Again, take a second to marvel at your work. Click “export”, then “best”, then “save”. If you want, you can click the add button under looks to save your effect and name it whatever you want. While this works really well for most B&W photos, it also looks pretty neat for most, if not all colorful ones. Go try it out! Another example of a picture edited using Polarr to achieve a unique effect, which also happens to relate to eiffel towers can be seen below. It can definitely be described as pop art and can be seen below. Okay, have you taken a guess yet? What do you think it is? Make sure to write it down now. As a courtesy, I will give you a little poll box, below. All you have to do, is write what you think the original image is down on a piece of paper and then say whether you think you know what it is or not. When you get to the end of this article, you can write a comment on what your (first, second, and third) guess(es) were for what you thought it was. I’ll bet you won’t get it right on the first try! Now, if it helps at all, here is another version, built on the same source image. It should make it just a little more obvious. Okay, fine, here is the source image. It is just a drawing of a waveform. I did not draw it. 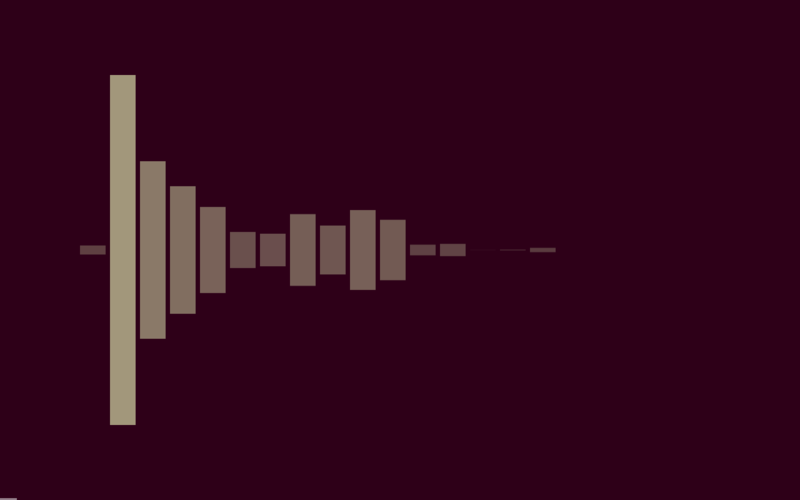 As a matter of fact, it was taken from one of the screenshots of Party Mode visualizer which just shows a block style waveform of the music that is playing. Party Mode visualizer was created by Mathew Preziotte and is actually quite sweet, go check it out! The original screenshot is below. As you can see, it has obviously been rotated 90° and cropped slightly. For the Second Effect, I’m not going to rob you of first-hand experience so, start off with the same as the first effect mentioned in this article and experiment around to see if you can achieve a similar look. So, what did you think of this article? What do you think of my writing style? What are your thoughts on Polarr? Would/did you download it? What did you think the original image was? Please leave any, and all thoughts in the comment section below. This is very cool! I do animation in Cinema 4D. I will have to check this out and see if it is of use to me too. Thanks for sharing!